About this Bamboo Cutting Board:Protect Your Countertops By Using This Bamboo Cutting Board.Silicone Thumb Ring.Meets FDA Requirements.Hand Wash Recommended. Due to this product's variance in composition, laser engraving may produce different shades of imprint. Special Instructions:Rush Service:Catalog Quantities Only.One Color And One Location. About this Tiny Tot Magnetic Timer:Compact magnetic digital timer.Contemporary bold color rubberized finish with metallic silver back.Features large digital display with minutes and seconds.Requires 1 AG10 battery (included). About this Smart Plastic Pizza Cutter:Easily slices pizzas, quesadillas, brownies and more. Contoured blade spreads apart cheese as it slices. Disassembles easily for washing. Top rack dishwasher safe. About this Indivdually Polybagged 4 Bag Clip:4" Chip Bag Clip. Available in wide selection of colors. Material: PolystyreneSpecial Instructions:Rush Service:Rush Service prices are for one color imprint only, standard ink colors. Multicolor imprints, halftones, additional location imprints and PMS matches will require an additional 1-3 working days. About this Polystyrene 6 Bag Clip:6" Chip Bag Clip.Material: PolystyreneSpecial Instructions:Rush Service:Rush Service prices are for one color imprint only, standard ink colors. Multicolor imprints, halftones, additional location imprints and PMS matches will require an additional 1-3 working days. About this Traditional - Style Non - Stick Pizza Cutter:Features easy-to-slice, non-stick roller; dishwasher-safe construction. Four-inch-long handle with thumb rest provides a non-slip grip and safe, comfortable slicing. Slices thick or thin pizza crusts quickly and easily.Material: ABS with Nylon Wheel. About this Top - Thiis Deep - Dip Non - Slip Ice Cream Scooper:Deep-dip design with a safe, non-slip, textured handle; Molded in tough, dishwasher-safe, polypropylene material; Extra-large copy area.Material: Polypropylene. About this Spatula With Convenient Hanging Hole:A value-priced, kitchen friend for cooking, baking and cleaning up.Long, rugged handles with semi-rigid, white, wipe-clean blades.Great for spreading jam, jelly, mayonnaise and peanut butter.Material: Impact Styrene. About this CookS Choice Translucent One - Cup Measuring Cup:An always-useful, 1-Cup size measuring cup.Calibrated in cups, ounces and milliliters.dishwasher safe.An attractive, easy-to-hold design that will compliment the cook and compliment your advertising message.Material: Polypropylene. About this Indispensable Multi - Use Kitchen Spatula:An attractive, easy-to-hold, kitchen necessity. Molded in dishwasher-safe, polypropylene material with non-slip thumb grip. Protective ribs help keep handle dry; convenient hang-up hole.Material: Polypropylene. About this Credit Card Powder Coated Bottle Opener:Heavy 14 gauge stainless steel speed opener. This bar blade is the perfect bar wrench. Credit card size. Fits in wallet credit card slot. About this Vinyl Wrapped Paddle Style Bottle Opener:Bartender professional paddle style speed opener. This bar blade is the only bar wrench you'll need! Don't settle for other imitations. Built to stand against the harshest conditions.Heavy 14 gauge stainless steel. Colored vinyl coating for easy gripping when wet. Thank you Marie, Jared and Mary! We’re glad to read your feedback! We make sure we deliver the exact product you envisioned! 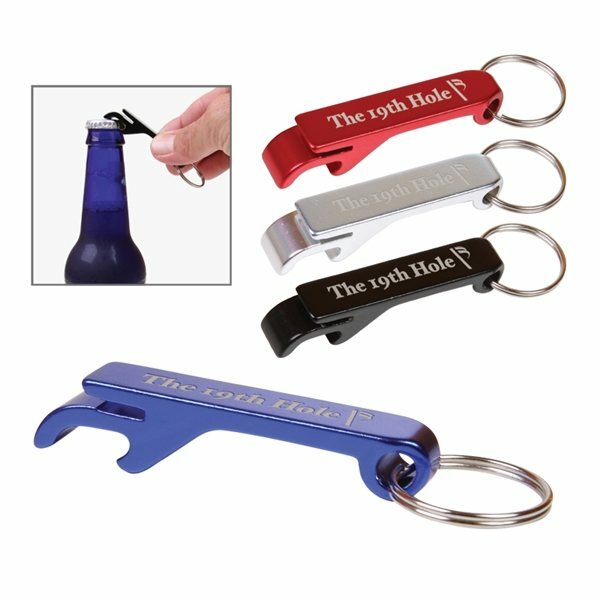 Our Aluminum Custom Bottle Opener Key Tag is a popular promotional item with customers because of how handy it could be. This item is on our Top 100 because customers love to carry it around with them. Marie is right, this is a good promotional tool! Available in silver, black, red, and blue. Thank you Bailey and Don! We’re glad the process was easy to order. Here at AnyPromo, we make sure the process is always easy for our customers. The Ice Cream Scoop is on our Top 100 because customers love to have this in their kitchen. For those ice cream days, it makes life easier to have an ice cream scoop. Durable plastic ice cream scoop made from food safe materials. Available in lime green and blue. Purchase your Ice Cream Scoop today! Thank you Dana and Dalton! This pizza cutter is on our list of Top 100 items because of its quality. It’s small and mighty and could cut easily through a pizza. Pizza cutters are great as a promotional kitchen utensil, because everyone loves pizza ! You never know when you’re going to need a pizza cutter, so give this away to your customers at your next event! The World's Best Pizza Cutter is the perfect promotional product to place your message into the most popular room in every home, the kitchen. The Promotional Pizza Cutter is used to cut pizza, quesadillas, Panini, flat bread, sandwiches, brownies, cooking dough, salads and more. Top five buyers are from: Banks, Credit Unions, Restaurants, Realtors, Insurance Companies. The Promotional Pizza Cutter features a removable plastic blade for easy cleaning. The Promotional Pizza Cutter also features a removable Stainless Steel blade available. Paper coupon attached to blade available. Blade style available as the KITCHEN KUTTER. The Promotional Pizza Cutter comes individually poly-bagged with instructions. The Promotional Pizza Cutter is made in USA. FDA Approved removable plastic blade. Order your pizza cutter here. There are over 900 promotional kitchen utensils available in our selection. Create the perfect meal with the items we have cooking! The kitchen is one of the most important rooms in a home. It’s where all the food is cooked up to feed the household. So why not make the kitchen more fun with our promotional kitchen utensils. We have bottle openers, oven mitts, measuring sets, aprons, silicone basters, pizza cutters, scrubbers, and more! Whatever the item you may be looking for will add a hint of taste to the kitchen. Kitchen utensils are great for home trade shows, cooking trade shows, cooking classes, wedding classes, and so much more! You could even give them out as an employee incentive! Look through our selection of kitchen utensils. Shop here! Our promotional cooking products are specially priced and professionally imprinted to vividly promote your brand. Search our site for a wide selection of kitchen utensils including aprons, digital pocket scales, kitchen timers and more! See for yourself just how high AnyPromo’s standards are when it comes to brand impact. Click through our inventory of promo cooking gifts on sale now. Here is a snapshot of our selection of promotional cookware and accessories currently available. We’re ready to help expedite your order, so give us a call! Prepare exciting meals with these great promotional gifts! Let the master chef in you come up with the best methods of cooking. Our promotional kitchen utensils will help you take the kitchen to a whole new level! Kitchen utensils are great for making the newest chef on the block feel like they own their own cooking show. Make dreams come true with our selection. With so many custom kitchen utensils available in our selection, you will have no problem finding the perfect one for your promotional needs. Need help deciding? Our customer service team is standing by to help you make your decision.